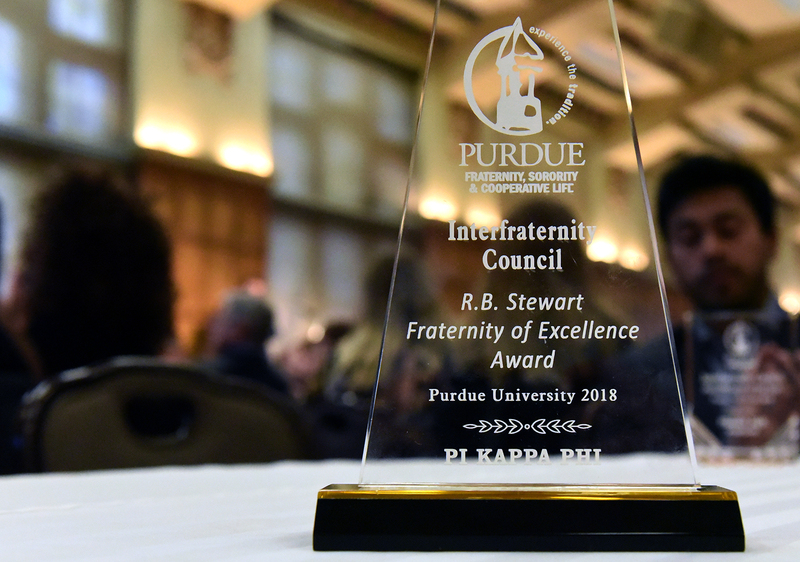 Pi Kappa Phi was named Purdue’s top fraternity for 2017-18 on April 9 at the annual Greek Awards Gala. The fraternity was chosen among six finalists that qualified in each of the judging categories for best chapter. Then the IFC finalists were evaluated statistically to determine the winner. In the Fall 2017 semester, for example, Pi Kappa Phi was No. 1 in philanthropic dollars raised ($112,354 with the closest competitor having raised $38,259), No. 1 in service hours (5,040, more than double any other fraternity), No. 2 in grades (3.27 average GPA, with 74.0 percent earning at least a 3.0 and fraternity average being 2.95) and No. 6 in chapter size (145 members when IFC average was 86) among Purdue’s 40 IFC chapters. The 2017 president echoed the sentiment. It was the second time in the last three years that Pi Kappa Phi has won the Stewart Award and 8th of the last 11 years. Associate dean of students for fraternity, sorority and cooperative life Brandon Cutler made the announcement at the awards event. Right before he announced the award, he quipped that it might be time to rename the award since Pi Kappa Phi has won it so much. Throughout his career at Purdue, Cutler has emphasized that Greek organizations need to prove their value to the educational mission of the university. Furthermore, they need to exceed be better than the average student. Also at the awards ceremony, Pi Kapp Pranit Das was named the IFC Philanthropist of the Year at the Greek Gala. “Not only does Pranit live what our philanthropy stands for day in and day out, he has a lot of accomplishments as a leader to showcase his efforts,” the chapter’s nomination for Das said. Das was Ability Experience chairman in the spring and continued to assist his successor and the chapter with various outreach programs for people with disabilities. It also marked the second year out of the last three that Pi Kappa Phi has had IFC’s top philanthropist.